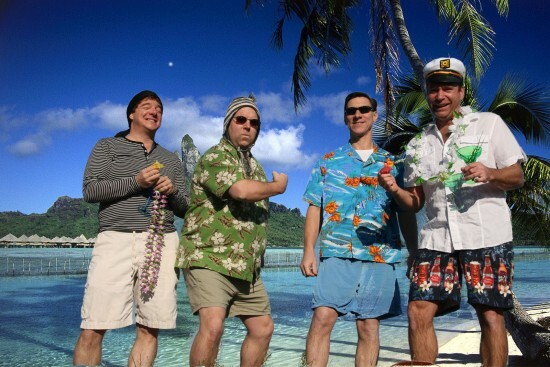 We are the Island Time Band, North Carolina's Best Buffett Tribute Show, and are available for your event. All Island Time shows include lights, sound, stage props and costumes to make for an unforgettable Buffett show experience. Some things you may see at an Island Time show include Parrots, Tiki lights, Limbo/Conga dancing, grass skirts, coconut bras and smiling faces. 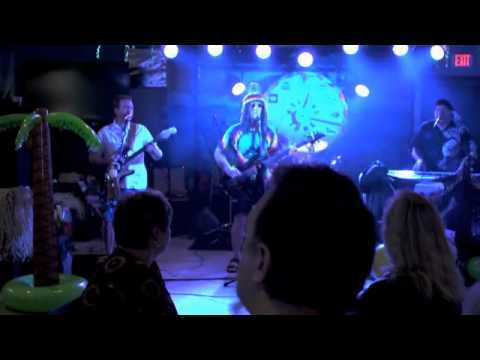 So reserve the Island time Band for your special event today! We enjoyed Island Time a lot. Very professional and easy going guys. Would use them again. We were looking for a good Jimmy Buffy tribute band for a birthday party. The Island Time Band gave us much more that we had hoped for. Their music got our guests on the dance flood (not an easy task). After a margarita or two we were convinced the Jimmy Buffet himself was with us. These guys are the real deal. A musical journey featuring a happy go lucky Australian, Jimmy Buffoon, the long lost cousin of the famous American with a similar name. Interacting with an ornery pirate, Mark Arrita, a disgruntled crew member who feels this ship has run a ground. Bringing up the rhythm section is an albino Jamaican and a deaf mute. Costume changes, stage props, comedy and great music fill out an Island Time show. Island Time is a collaboration of North Carolinas finest laid back musicians playing not only the music of Jimmy Buffett but many other island specialties. We are a nautical themed band, which means all songs have a connection to either sailing, captains, pirates, oceans, islands etc. We like to think of ourselves as an Island Rock Band. In addition to the high quality of the music, Island Time also provides a show complete with stage props, costume changes and characters. Character synopsis: Guitarist/Lead Vocalist is Captain Jimmy Buffoon. A long lost cousin from the outback in Austrailia of the well known Jimmy Buffett from Key West. Keyboardist/Lead Vocalist is Mark Arrita. A disgruntled pirate whose time on shore has him believing a mutiny is in order to get this band of misfits back out to sea. Bass Guitar/Backing Vocals is Bud Wiser. A smooth talking soft spoken Albino from Jamaica. 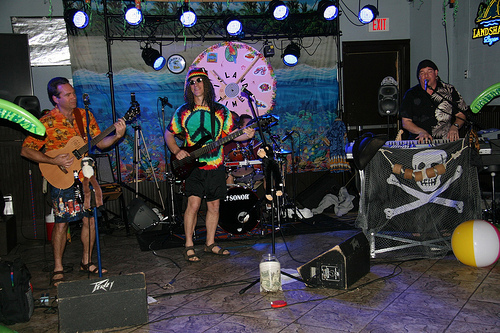 Drummer/Percussionist is Flip Flop who happens to be a deaf mute. Jimmy Buffett, Van Morrison, Seals and Crofts, Little River Band, Journey, The Eagles, Grand Funk, Billy Joel, Elton John. 1 or 2 20 amp 120 volt circuits. If outdoors some type of roof or tent.